The Honda Civic is one of the most popular automobiles in the world, and rightfully so, as it offers an incredible list of amenities, excellent interior comfort, great performance, and outstanding fuel efficiency. 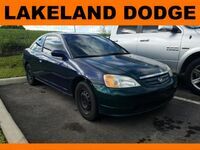 Not only does a used Honda Civic in Tampa, FL gives you all those sought-after qualities, but it does so at an extremely affordable price. A used Honda Civic is available in many body styles that include a sedan, hatchback, and a two-door coupe. It is also available in many different trim levels and offers a wide variety of engine options to choose from, so you can get the fuel efficiency, performance and features and options you want and need every day. When it comes to innovative technology features and affordable comfort options, very few vehicles, if any, can compete with the offerings of a used Honda Civic in Tampa, FL. Whether you’re looking for an intuitive infotainment system with touchscreen controls or you want the luxurious comfort of leather upholstery and automatic climate control, you’ll find them all available in a used Honda Civic. The impressive list of features and options a used Honda Civic can offer you include driver and passenger favorites like full power accessories, touchscreen display, USB ports, premium audio system, a rearview camera system, Apple CarPlay™, Android Auto™, navigation, remote engine start, satellite radio, heated front seats, voice controls and much more. 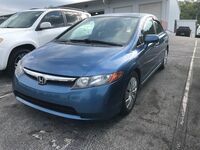 Used Honda Civic models in Tampa, FL at OkCarz also offer the auto industry's most innovative safety systems such as adaptive cruise control, forward collision alert with automatic emergency braking, lane-departure warning, lane departure intervention and many others that will help keep you protected while on the road.